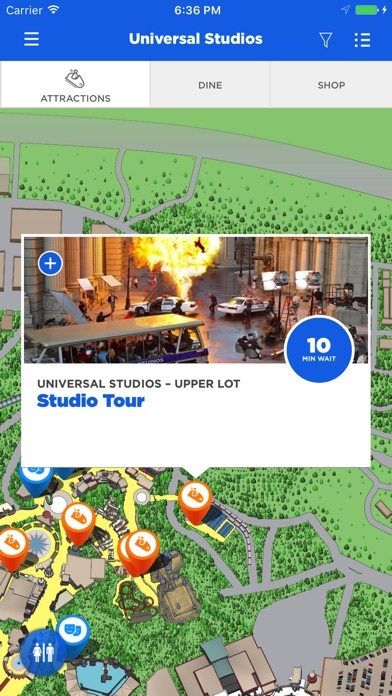 Put everything you need to know about your trip to Universal Studios Hollywood in the palm of your hand. 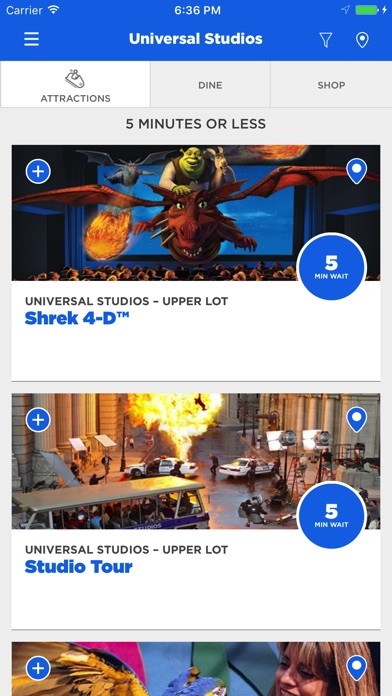 Download the official Theme Park app for free! It’s the easy way to: •	Purchase select single and multi-day Theme Park tickets in the app. •	Check ride, show and attraction wait times at home, on the go or in the park. •	Customize your park experience using the itinerary, filtered lists and the map to plan your day. •	Set ride wait time and show time alerts to make the most of your time in the park. •	Stay up-to-date with in-park notifications and news about upcoming special events. 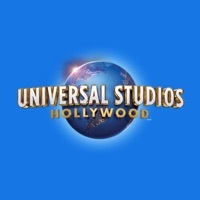 •	Share your Universal Studios Hollywood experience on Facebook and Twitter. •	Explore the park using the detailed map view. NOTE: Continued use of GPS running in the background can dramatically decrease battery life. Love the app. Not being sarcastic. I was looking for specific item (on the map and it’s too vague. Make this happen. I feel like you guys are years behind in your ticketing/gateway system. I would love to be able to buy and renew passes from the app and just show my phone at the gate and or food/stores for discounts. It would be a million times better if there was a membership feature which contained your pass for easy availability, account updates and other membership info. To be honest it’s quiet surprising and disappointing that it’s not available. We have various memberships to much, much smaller venues and they even offer member apps for easy barcode scanning upon entrance (in addition to ID at some). We took a family trip this weekend with the whole family(8) Best time ever!! Loved the Harry Potter attractions, and the ride was awesome rode it twice lol. And glad we upgraded to the year pass definitely will be going back. Can’t wait for the Jurassic Park attraction! You guys should add the weather !!! The service is awful, the workers are rude and Everything is expensive. With the type of Money they charge, they should be providing world class service. All they want is to take your Money! I went with some friends without the wife and I ended up purchasing the season pass, I told my wife how awesome it was and she went with me and ended up getting the pass also. We’ve been back at least 10 times since and are going again on January 29th, I can’t wait!!! Was amazing had no problems whatsoever and it was very fun! The app was great and helped us out so much by showing where all the rides and bathrooms were, definitely coming back again! It’s a mess. On the Itinerary portion of the app, nothing I create saves when I rearrange my schedule. Often it duplicates the ride/show/shop in the list, forcing my to delete. The maps are posted by ride and unclear, so that planning is a guessing game. The best part of the app is the wait times. Sort of ruins the schedule streamline if the prder pf items on my itinerary keeps going back to default. FIX! 1. Make this actually usable on iPad. 2. Let me buy tickets and use them from the app. None of the print at home stuff. Park was fine but I’m not game for long waits, personally, so just not worth it for me. This app is not very intuitive. Doesn’t show you where you are in the park. While looking for dinning facilities the menus only give you generic information. Example “peanut free options”. All important for those with allergies but I would also like a list of what they serve. I was amazed by the full scene themes of every attraction and performance great job in doing so, but I feel some theatrical screen lines could be added to the hogshead eating areas alongside the theme music as well as more cast and characters to the theme park and overall for my first visit it was awesome and will definitely be going again thank you! The wait times posted on the app are always wrong. This is the worst theme park app. It doesn’t tell you where you are or how to get anywhere. Worthless. This really helped me plan my birthday party! It is very helpful through the park. It gives very accurate wait times and is a great app. It actually helped me when I went to Halloween Horror Nights this year! 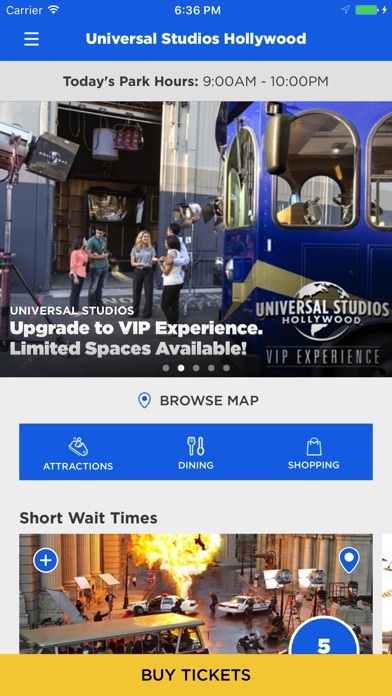 I would recommend this app to anyone going to universal. The map is not intuitive. Search does not find key attractions. If you don’t mind walking all day this is the place for you. The scariest of all mazes is the line maze itself. The lines are never ending and wrap around each other several of times and when you finally enter what you think would be the most exciting thing ever considering it is Universal Studios, you are completely let down. I recommend going to watch a scary movie and dinner afterwards with the family. Beware Beware Beware I repeat stay home and save your money. This was a huge let down. Your so-called loss prevention is worse than the Police when it comes to racial profiling. I was followed up and down the stores by “undercover” loss prevention. Made me and my family feel very uncomfortable. When I brought this issue to Customer Relations they apologized and handed us a couple of front of the line tickets. Not good enough. Very disappointed. As if that was suppose to make up for our inconvenience. Nothing like the subpar service from Universal. I knew there was a legitimate reason why my family and I enjoy all our visits to Disneyland a lot more then any other theme park. Everything is seriously over priced!! Can’t believe I paid 15 dollars for a burger and 10 fries plus 3 dollars for 1 drink and can’t even get a lid or a refill! Also waited 25min for 2 burgers (krusty burger) This place makes a ton of money and can afford one stupid refill. I’m glad my annual pass it’s almos expired because it’s insane all this prices. I will definitely take my business elsewhere in California. I drive for 4-5hr to this? Forget it.. Also your system on the tickets to hand out peoples food it’s a joke! Guy gets confused with all the tickets. You guys should get a better system with the money you saved with all the refills and lids you do not give! Unorganized entrance with thousands of people in front of us. Some man screaming on an intercom trying to direct people. This was the most stressful experience trying just to get in. Three out of five of our party were given their fast passes two of us were directed to the box office where there was another hundred people in line. I had to cut the line and luckily one of the attendants printed our passes. Apparently they had a “ systemic failure” and boy was this a failure. We have tickets to fright night this evening and I’m already dreading coming back. It would be great if my itinerary could show on the map... maybe it can I just figured out how so we don’t end up running from one side of the park to another without having to edit. Over all usability of the app is fine. Though having the menus on restaurants would be nice. The worst part is the wait times listed on the app. We got on a line that said it was a 45 minute wait (the sign at the ride said the same thing) and ended up waiting in line for over and hour and a half. We love Universal. But there have been a few things mags that were inconvenient about the passes. It has been somewhat of an inconvenience to schedule at times with black out dates. Particularly having all of July and half of August blocked out. (My only summer vacation time.) and now with 3 Saturday’s in October blocked out when we really wanted to add horror night. Only other difficulty is my size. I’m a large woman and there are 3-4 rides I can’t ride including the 3 new rides in The Harry Potter area. Being new it would have been nice to consider larger people. And it’s a bit embarrassing to try your sample seats right out on display for everyone to watch you fail at closing the security bars. I understand you want people to see so they don’t waste their time in line, but there could be an example and perhaps have the actual practice seat around a screen of some sort. It’s a bit humiliating and shamming. Never coming back here again. Got put together on my online purchase. I have no idea what the heck they are referring to but I bought upgraded tickets off there crap of a website to get in early and have express line. Not the case. Bait and switch. No early entry even though receipt and website say as much. Manager about the front gate was absolutely no help. Kept going in circles. Seriously got put together on these tickets. $450 later I don’t matter. I won’t drop names on managers as they need a job like everyone else but uvs needs to knock this crap off. 14yr old son is really bummed as is my wife and I. One and done. To many other Halloween events. Next step remove self from emails and mailing list. LOVE this park! The rides are fun, shows are entertaining, park is clean and staff is friendly and helpful which is huge. The app is great - line times, up to the minute ride/show info, food, etc. def recommend! Universal Studios is an awesome place to visit. The attractions, rides and shows are above all the other amusement parks. Halloween Horror is better and better each year. Hopefully they will have the New Years Eve celebration like last year. Universal Studios is by far the place to go in Southern California. 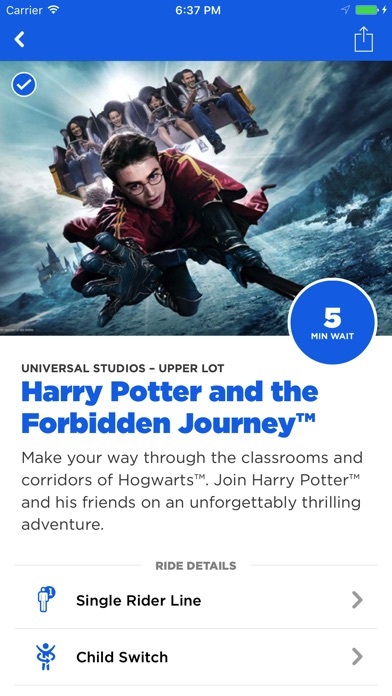 I can not believe that each year universal charges more each year for express passes. This year they decided to take away the passes WITH lanyards and instead give you a paper ticket that you have to find to use at each attraction. It was a hassle to keep digging in your pockets to find this flimsy piece of paper. Since I was in a bigger group, there was at least one person that had to check multiple locations to find the tickets! It was annoying! It was a relief to leave and not have to worry about misplacing the little piece of paper. What a joke! We were really upset when we priced lanyards and they started at $10 and after spending 180 for tickets for 5 people ... we really felt another $50 was ridiculous next year we might try knotts or Queen Mary! I went yesterday beacause I have season passes! It is amazing !!! I like universal studios Hollywood apps because it shows you everything on the universal studios apps and the time and maps 🗺 too. I really looked forward to the Studio Tour but was unable to clearly hear our tour guide C.J. for almost the entire tour unless we were at a complete stop. I mentioned to her 3 times during tour that we couldn’t hear her but there was very little acknowledgement of the problem. I would’ve rather not had her speak at all and just read subtitles on the video screen, especially during the 50% volume reduction areas during which we could hardly even hear her talking at all. I told the bus driver Rob afterwards that the speaker system was horrible. We are going to try the studio tour one more time today to see if it improves w/ a different guide. 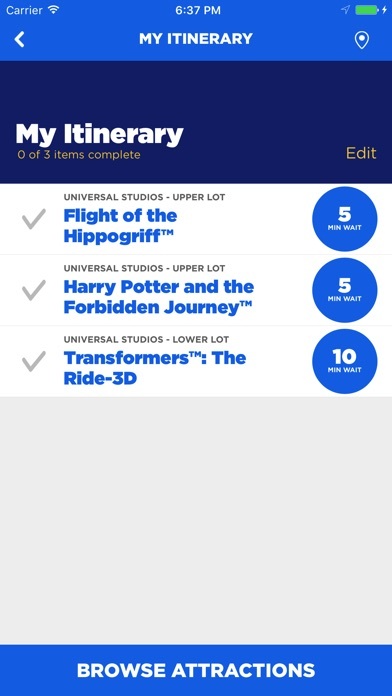 I LOVE this pass but what will make it even more enjoyable will be a feature that can let us the annual pass holders have an option to link our pass or make an account as of what the Disney app has so that we can just have it linked to our phone Incase we might of misplaced our pass or something.